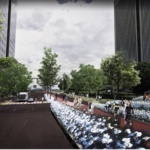 Los Angeles and London–based Spatial Affairs Bureau has unveiled a series of transformative concept designs for a major new downtown linear park that would reconnect several communities and establish key points of access to the historic falls of the James River in Richmond, Virginia. The so-called Richmond BridgePark plan has been in the works for over six years as part of an expanding set of improvements slated for the city’s waterfront, where several historic and modern bridges cross over the James River. 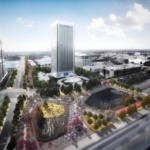 The aim of the project is to connect the city’s downtown and South Side neighborhoods by creating new pieces of pedestrian-focused urban infrastructure that can draw both sides of the city together. Within a short section of the downtown area, the river is crossed by bridges at 14th and Manchester Streets as well as by State Route 301 and Interstate 95, among other crossings. The latter three spans were built as part of modernization efforts during the mid-20th Century, but their wide configurations and oversize arterials have isolated spaces and dislocated communities. 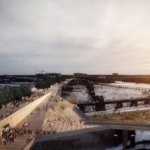 With their expansive plan, Spatial Affairs is aiming to remedy at least some of these malignant conditions by “borrowing” space from the bridges in order to create a pedestrian boardwalk across the river. The plan also calls for transforming an existing but disused median along the bridge into a “bicycle superhighway” that could carry bicycle commuters over the river, as well. 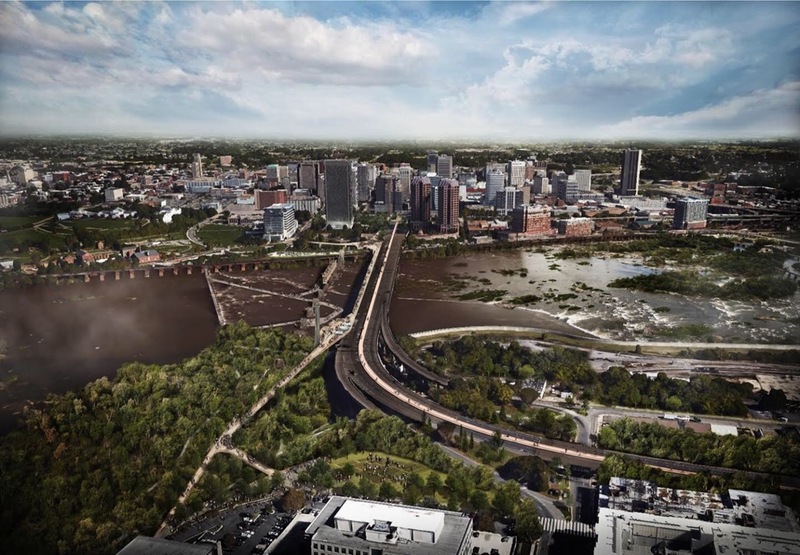 The paths will have generously landscaped footholds on either side of the river, according to renderings, and will extend formally and informally into the neighborhoods on either side. 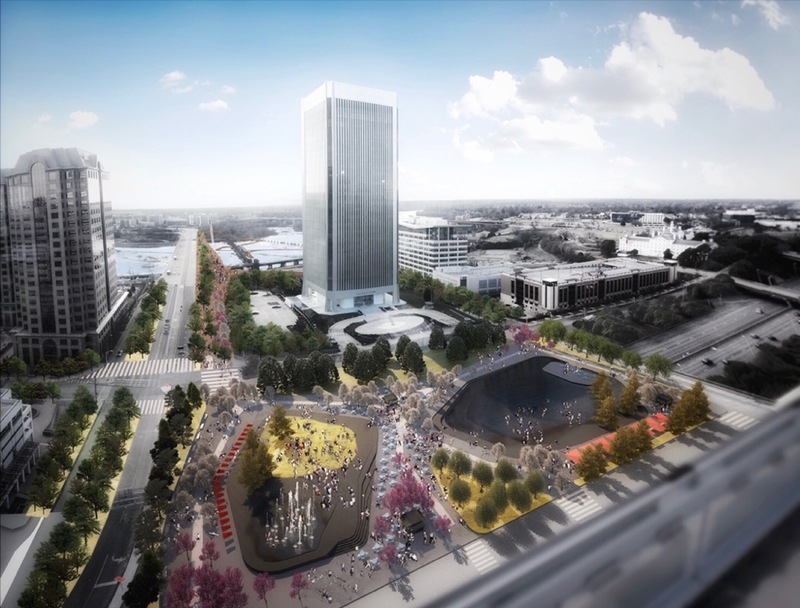 The reworked transportation route will also host several of the city’s Pulse high-speed bus lines and add a new interconnected park system studded with event spaces and public art. 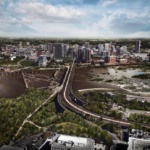 Another aim for the project is to create a new people-centered route that offers expansive views of a historic train viaduct that was burned down at the conclusion of the American Civil War. 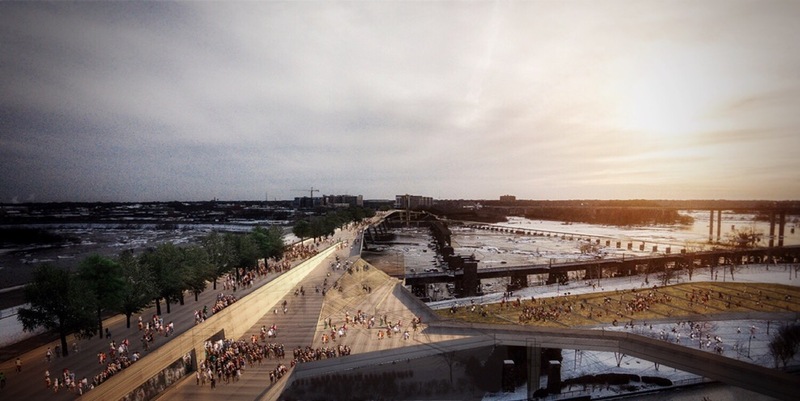 The remaining foundation elements and ruins will be visible from the pedestrian bridge and will serve as a focal point for the entire project. The project is moving into the final design stages over the next couple of years as work continues on a private fundraising campaign aimed at funding the plan. Meanwhile, backers of the BridgePark are moving toward getting the city to include the initiative in the city’s forthcoming development plans. The unveiling of the conceptual plan for the project follows a six-year-long community outreach effort and the completion of an ideas study by Spatial Affairs Bureau in 2015. Spatial Affairs has an office in Richmond to help coordinate the project. Buro Happold New York is on board for structural and economic impact studies for the project with Sam Schwartz Engineering working on the pedestrian, bicycle, and vehicular transportation strategies. Timmons Group will provide civil engineering services while Gardiner & Theobald will conduct cost estimation for the project. A timeline for completion of the park has not been announced.